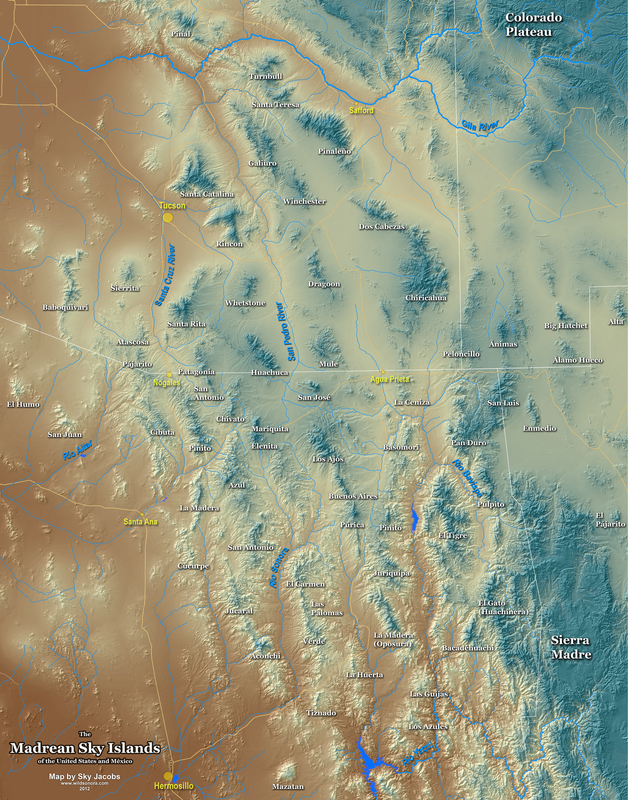 This map shows the major "Sky Islands" of the southwest region. The Sierra Mazatan just east of Hermosillo is probably the southernmost Sky Island. The westernmost Sky Island is the Sierra El Humo. The northernmost is questionable. The Pinal Mountains are certainly a Sky Island, but how Madrean they are is questionable. Mt. Turnbull, the Santa Teresas, and the Pinaleño Mountains are all at the northern extent of the Sky Islands. The eastern edge of the Madrean Sky Islands is disputed. I have arbitrarily decided what to include on this map.